Just a couple of days earlier, we had reported that the latest addition to the Akshay Kumar starrer Housefull 4, would be Sanjay Dutt. 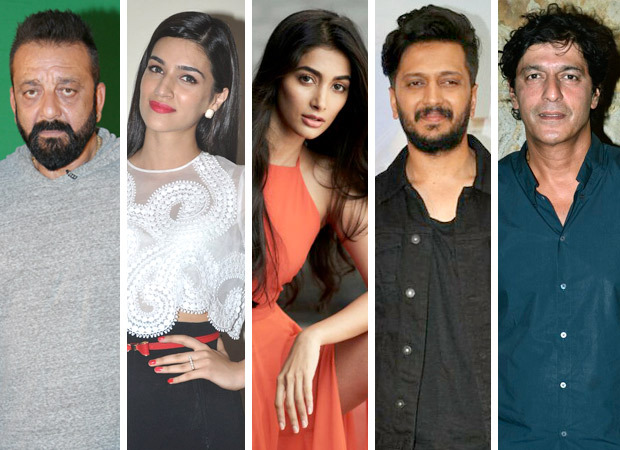 Now along with Sanju, the rest of the cast including Kriti Sanon, Pooja Hegde, Riteish Deshmukh and Chunky Panday are expected to shoot in Rajasthan. But the team will take off to the scenic locations only in the second schedule. Recent reports have it that Housefull 4 will kick off its first schedule in London. Whilst all Housefull movies have been shot in the Queen’s city, this too will be no exception. This schedule is said to start from July onwards. Post this, the team will return to the country to shoot in Rajasthan. Speaking on the Rajasthan schedule, it will be almost a month long. Readers may recall that Housefull 4 is about reincarnation. Hence, the unit of the film is expected to shoot the past life portions in this picturesque place. Adding further, the Rajasthan schedule will see the team sporting rustic look of a completely different era. It has been learnt that the flashback sequences in the film will be presenting the era when India was ruled by the kings. According to reports, it is being said that the first schedule in London is 25 days. The last schedule of the film is being planned in Mumbai where a grand set will be erected. The makers are keen on completing the shoot of the film by November in order to keep up with the release date. It is being said that Housefull 4 is one of the grandest films in the franchise. Speculations have it that Kriti Kharbanda, villain Ranjeet, Boman Irani too have been roped in as a part of the cast. Besides them, Housefull 4 is said to star Bobby Deol and Abhishek Bachchan in integral roles. Director Sajid Khan returns to the franchise with this installment. Produced by Sajid Nadiadwala, the film is slated to release during Diwali 2019.